Hello! so did you hear of the instagram personality Essena who reportedly had over 500,000 followers, was being paid well to advertise but recently quit social media stating anxiety and the "unrealness" of it and mentioned how just to post a picture, she would have it taken over 20 times just so it's perfect and hoped it'd be liked. I recently saw tags of #socialmediaisnotreal as a reaction to this and I have to say, it's what you make of it. Although I applaud her message, I say we have to remember people only show you what they want you to see on social media. I can understand what she meant by trying to get a certain picture to post because I'd found myself at one point being caught up in wanting my picture a certain way and if it was not, I didn't like it. This is unfortunate because it can take away from enjoying the moment. Then I took a step back and remembered why I started blogging/instagram which was to unwind, a hobby to share my style and connect with others. So if it does not serve this, then I'll stop. I am now at a point where I don't stress too much about the picture, do not care for much editing (I share edited and unedited), and I'm at an I don't give a F*** attitude. If I like it enough to share, I'm ok with it if it's liked or not. Besides everyone can't be pleased. 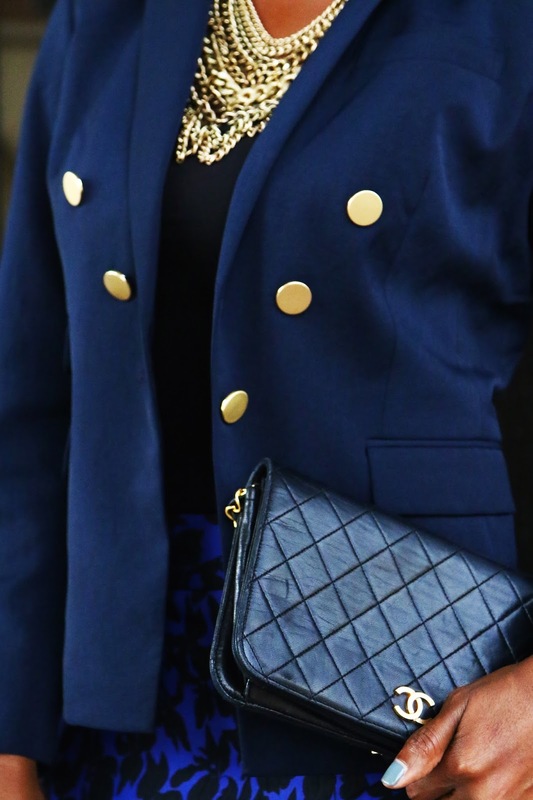 With this outfit, I decided to pair this navy blazer with the blue patterned skirt as an outfit I could wear to work (with tights) but decided to enhance the gold details from the buttons with the necklace and bag for an outing. 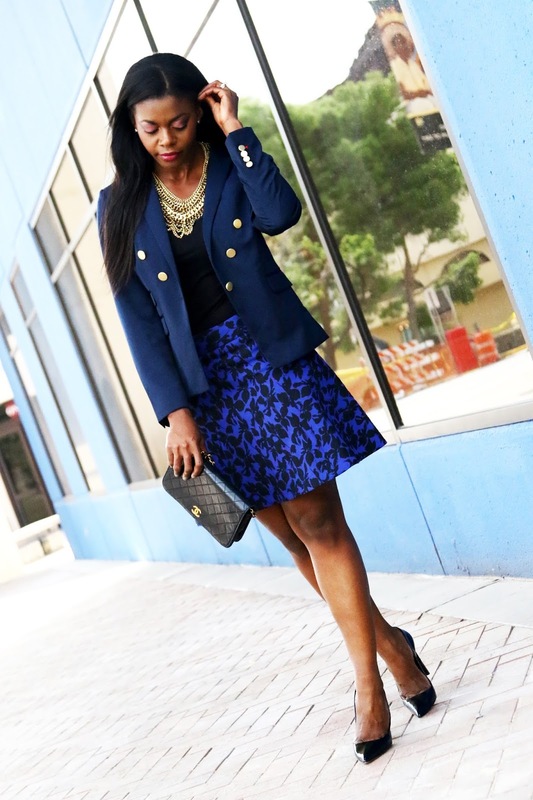 I love blazers, they are definitely one of my closet staples. I think they can be worn for work, casually or date night. Thanks for reading! Heels- Casadei (Similar), Skirt- Express (Similar), Bag- Gift/Chanel (love), Tank top- Forever 21 (Similar), Blazer- Express (found in store, Similar), Necklace- Bauble Bar (Here). As for social media, I get where Essena is coming from but I don't think one needs to completely break away from it. I think it's all about balance and not obsessing over post the perfect picture because nobody is perfect. I think one of the main reasons people turn to social media platforms like Instagram, is for escapism and inspiration. Just like we watch tv & movies or read books and magazine. We just need to remember to balance it with our everyday lives.